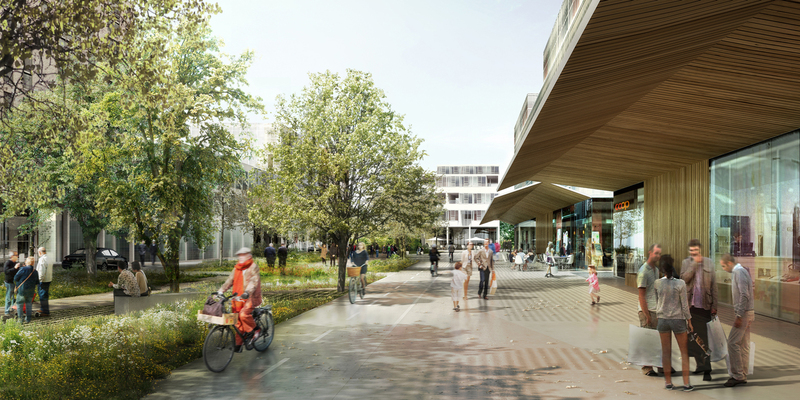 The award-winning Paris and Basel-based architecture and urban design practice AWP led by Marc Armengaud, Matthias Armengaud and Alessandra Cianchetta has won the competition for the post-industrial redevelopment of Orée de Crissier municipality to the west of Lausanne in Switzerland. The scheme is for the urban design of a 68,000m2 site with 390 housing units, a mix of tenures of apartment blocks and houses; 27,000m2 of green recreational space in a network of public areas; a hotel, health, education facilities, nursery/crèche, administration buildings, shops, cafés and community amenities. AWP, Orée de Crissier urban scheme, Lausanne, 2013. The location has stunning views over a lake to the Alps and Jura, and following a masterplan for the redevelopment of the site, a former brickyard, the Canton, the municipality and the owner, Conzzeta Group, have signed a framework agreement to regenerate Orée de Crissier‘s disused, formerly industrial areas. Public and private interests are being given equal weight throughout, including an agreement on co-financing the public infrastructure. ‘It is the first time that private and public stakeholders in Switzerland have collaborated on the transformation of a former industrial site’, says Cianchetta. AWP’s layout is based on a grid system with a range of building typologies giving flexibility to the site, and the project consists of 60% housing and 40% amenities. AWP office for territorial reconfiguration is specialized in architecture, landscape design, strategic planning and urbanism and have a track record of projects in France and internationally ranging from major large scale public schemes to temporary installations. The practice was awarded the French Ministry of Culture’s Prize for Best Young Architects in 2006, and the French Ministry of Transport, Housing and Ecology’s PJU urban planning award in 2010. AWP is currently working on the strategic masterplan for the development of urban space in the La Défense business district, and designing a 800m2 long public space below the Grande Arche de la Défense, after winning competitions for these schemes in 2012, as well as a series of follies and buildings for culture and leisure there. Clients include several European cities including London, Sandnes (Norway), Geneva, Lille and Naples, metropolitan and regeneration authorities, cultural institutions and developers.